From left to right, Belgium defender Daniel Van Buyten, midfielder Eden Hazard and midfielder Adnan Januzaj at a training session at Mineirao Stadium in Belo Horizonte on Monday. The 2014 World Cup’s host country returns to action Tuesday, but we’ll be watching another game, in search of wunderkinds. 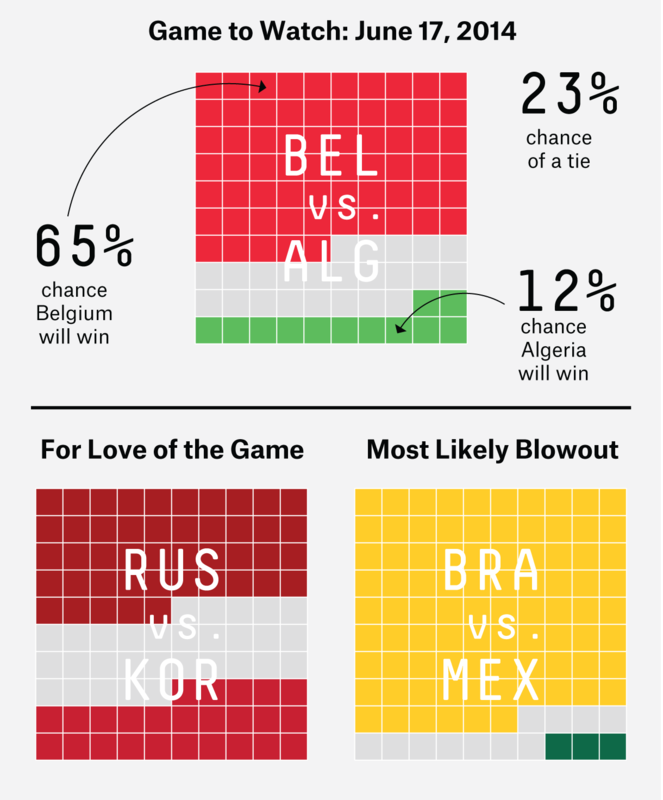 See our World Cup interactive for the latest probabilities. Before we get into why Belgium and Algeria is our game to watch, we should note that we cheated a bit in our criteria for Tuesday’s pick. Typically we’ve taken the greatest harmonic mean between competing teams’ SPI scores, which — as of Monday night — would have put the Brazil versus Mexico match atop the list at 82.4. But we’ve already seen both Brazil and Mexico play in this tournament and their matchup is one-sided, with Brazil having an 86 percent chance of winning (Mexico’s is 3 percent). So instead we’ve chosen to watch one of this year’s dark horses, Belgium, in its tournament debut. Belgium currently has the eighth-best chance of winning this year’s tournament (a mere 1 percent chance, but still). It’s the only team in SPI’s top 10 that hasn’t played yet. Its opponent, Algeria, on the other hand, has the lowest SPI of any team in the tournament and likewise a less than 1 percent chance of winning it all. But we think Tuesday’s matchup will be much closer than anticipated — the projected goal differential between the two teams is only 1.2, compared to 2.6 in the Brazil and Mexico match. But what’s most exciting about Belgium (which returns to the World Cup after failing to qualify for the last two tournaments) is its youth: 23-year-old Chelsea midfielder Eden Hazard, 21-year-old Everton striker Romelu Lukaku, 22-year-old Wolfsburg midfielder Kevin De Bruyne and 19-year-old Manchester United midfielder Adnan Januzaj all have dazzled in the top leagues in Europe but have yet to play on the World Cup stage. Both Belgium and Algeria feature rosters with 10 players under the age of 25, but Belgium’s youngsters are some of international soccer’s most talented. Hazard averaged 0.4 goals per game with Chelsea this year, and Lukaku averaged 0.45 for Everton. Many analysts discount Belgium’s talent after it breezed through qualifiers against teams like Macedonia and Scotland, so Tuesday’s matchup against Algeria will be the first time we see what these kids are really capable of. Third time’s a charm. The United States entered Monday’s match against Ghana aiming to avoid becoming the first country to lose to the same opponent in three consecutive World Cups. Punctuated by a quick Clint Dempsey goal, the U.S. had the best of the first 10 minutes, with 66 touches to Ghana’s 52, including a 30-13 advantage in the attacking half. But from the 11th minute onward, not so much. The final score — 2-1 United States — didn’t reflect it, but the U.S. spent most of the game on its heels. The U.S. ended the match with 88 touches in the defending penalty area, the most by any team thus far in the World Cup. U.S. Goalie Tim Howard ended as the team’s leader in touches with 61, as well as pass attempts with 49. The U.S. recorded 45 clearances as a team. It’s the most by any team in a World Cup match since at least the start of the 1966 World Cup, as far back as ESPN Stats & Info’s data set goes. In the first match of the day, Germany became the first country to play in 100 World Cup matches, and in its 4-0 dismantling of Portugal was the first nation to score at least four goals in four straight openers. Germany had a slight possession advantage over Portugal, amassing 684 touches to Portugal’s 556, but had a big advantage where it counted; Germany had 24 touches in in the attacking penalty area compared to Portugal’s eight. Mario Gotze had more touches (nine) in the attacking penalty area than the entire Portuguese team. Portugal’s Cristiano Ronaldo managed just one touch in the attacking penalty area. Algeria versus Belgium is the most mismatched pairing in Group H, with a 65 percent chance of Belgium winning and just a 12 percent chance that Algeria will claim victory. And this imbalance is no less true in the countries’ trade relationship, at least as far as diversity goes. According to OECD data, Belgian exports to Algeria in 2011 totaled $2.06 billion spread over a wide range of categories — the plurality of which were cars and car parts at 22 percent, closely followed by preserved milk at 21 percent. But flip the relationship around, and a whopping 92 percent of Algeria’s $3.45 billion in exports to Belgium consisted of crude petroleum. Mexico and Brazil, on the other hand, have a much more symmetrical trade relationship. On both sides, a majority of the exports was some type of machinery, which made up about 53 percent of Brazil’s exports (a well-spread mix of everything from cars to sewing machinery) and 58 percent of Mexico’s (of which cars made up a 46 percent plurality).